2P STOP! | 2P START! Well, if art imitates life, then you can assume that I’m about to become a father! The day of anticipation is just around the corner (June 18th really is the due date). We do know that it’s a girl, she’s looking healthy, and she doesn’t have a name yet (suggestions?). It will certainly be the biggest change in my life, but I’m really looking forward to meeting my little daughter. On the comic front, it’ll certainly be interesting to see where we go from here. We don’t have any intention of actually killing the comic, despite Ray’s fears to the contrary. Life will be busier, but the comic must go on! Hmm. Amy is a good name. She always fancied Sonic. Speaking of pregnant, I wonder what Sarah’s hot body looks like right about now… did it look like she ate a basketball? If I could, I’d be giving you a cigar man, again I congratulate you and your wife on the opening of a new chapter in your life. I suggest you make your daughter a Mii upon birth, so she is included in any future vidogaming she may engage in later on, better safe than sorry. Congratulations!!! Neeew Baaaby (read that in the Mario Party 4 ‘new record’ Toad voice). And as for names, even though a video game name seems obvious, I’ll be slightly more realistic. I really like the name Maya, as well as Jocelyn. And of course, something from the family can never be wrong. There is only one name for a girl. I’m not sure what else to say beyond Congratulations, and Great Comic Guys (I don’t think I’ve ever made a comment that simple; it feels so strange)! We now know the purpose of the Swimming Pool of Money. It has officially become savings for college. Perhaps you can fill it with something else now. Something like responsibility, pride, or Dr. Pepper. congrats, tim!!!!! wow, well, I hope ur gonna post pics of her. great comic, and on the name idea, I’ve always thought, Skylar was a great girls name. My gosh… That is just odd. “Sarah’s hot body looks like now”. Don’t think that he doesn’t watch you sleep Tim. Hope it’s, well… It’ll be an experience. Plus if you let Ray feature in her life she’ll take the loveable goofball part of him and (hopefully not though) your monotone. It’ll be awesome. and I want a 2pstart calendar! Wow! Congratulations Tim! As for the name, I’ve got nothing as of now. Also, the comic was great! Let’s hope that Ray’s fears are just that, fears. I think you mean Kaylee. The name itself is one that would appeal to a mom but a dad could easily transform it into a nickname like Tails……. As far as names go, how about Kelsey Christene. Then she could go by Kelsey, Chrisstene, Christy, K.C., or lots of other non-name related nicknames. If you wanted to be subtle you could name her Apple, so she doesn’t know she was named after Peach, but Apple is also the name of my neighbors really annoying dog so maybe that isn’t the best idea. and to finish it off, CONGRATULATIONS! Names? How about Rouge!?!? 😛 No I’m not serious. Maya’s actually a pretty cool name Tacos, plus it’s the name of two pretty spiffy video game characters. Crimson Viper and Maya from Phoenix Wright. Anyway, I can’t wait until June 24…when I get to see what this new addition to the site called “Crap” is. Sounds exciting! Hmmm… names um Candice, Maggie, Maranda, Jessica, Taylor…well after that I’ve got nothing. But, let me get this straight… Tim calls Ray to announce that he’s becoming a father at a game store?? Or does Tim’s house really have shelves neatly lined with game boxes? Ray, it really doesn’t hurt to have a “Plan B” in case this really dies. No, not murderating the kid because you’re obsessively in love with Tim. I mean a job. Being the graphic designer you are, it can’t be too hard. Again, congratulations to Tim and your wife too. And Ray should not be jealous of the attention the baby will gain now. Good luck to all of you. She’s going to be a Gemini and is expected 2 days before my B-day. Your also lucky, You have 6 months between Christmas and her bday lol. As for a Name I Elika sounds Good, Zoey “In case she needs to survive the Zombie Hoard”, Raven, Cortana….. Ok I’ll stop looking at my Games while I think up names. First off love the Doomsday clock icon. And secondly, welcome to the world of Parenthood Tim. As a father of two, I know you’re gonna have a blast. In between the diapers, late night feedings, and wondering if she swallowed something whiel you weren’t looking. Kidding. No need to panic. Then the panic may begin. PS: Since everyone seems to enjoy basking in the appearance of grave risers, allow me to note that I ninja’d outta my grave way back on Feb. 16, for the Anti-Valenties comic. So does that make me a zinja? Or a nombie? Shiny! uh, I mean, River? Also, I just noticed, it’s the return of the Raybobama logo. Don’t worry about the comic though… I could always do some guest writing. I’d introduce a sassy black woman who’s main catch phrase would be “Mmmmmhmmmmm” and would say “Oh no you didn’t” any time a new Sonic game is announced. If we take in considaration that most of your comics comes (i think) from a last minute discussion, that could be taken as if this just happened, but that would make the pregnacy either 8 months short, or 4 months overdue, I doubt it’s either of that, I’d say more October or November if I’d have to base myself on the blurry calendar in Ray’s appartment… Well as long the comic still exist, some website have garbage and crap to sometimes, unless it’s supposed to mean that monday is the day to take out the trash, and wednesday is when Tim come around with the baby…. long comment for what it’s worst isn’t it? wait why would you write down the date on your physical calendar, ray? you have an iphone there, why dont you make use of some of its apps? unless this comic is also making fun of the iphone! ha! i got the secret message! xbox360 rules! Congrats Tim! Hope the babys healthy! Wait a- oh, oh yeah, real mature guys. A 2P Start Calender in Ray’s house yet again! When are you going to release it! I like Lilli, but f you want to go for something video-gamey, DON’T! You don’t even know if she’ll like them! Well, unless you hold an SNES in front of her when she comes out. Hey… that’s not a bad idea! Just make sure that if you can’t carry a console so you just grab a game, god forbid it’s Sonic Unleashed! HEY DADDY! PRESS THE A BUTTON TO CRADLE ME!!!!! JK, but in terms of names, I have always like Lily, Nikki, or Teresa! Just a question, will this be like a comment of the week, where one lucky 2pStarter will get their name chosen? Seriously though, congrats! I seriously can’t believe that no one has suggested Lace yet. Next year, obviously! Because a) if you hadn’t noticed, the calender has the most recent comics on it (notice how June’s month is black? That’s because there’s nothing to put there yet!) and b) from a sales stand point – no one buys calenders in the middle of the year anyway. They’re much better sold at the beginning and end of the years. Hey, hands off my kid’s name! Also, I would totally buy a 2P START! 2009-2010 Fiscal Year Calendar. Looks like somebody didn’t use the “noob tube”. Just kidding. Longtime reader, first-time commenter. Congrats. …if you really want to count that funky Bowser wallpaper that could have been so much more…….I count 10. Well…it looks like Ray is going to have to go back to running through loops and collecting rings again. Maybe the Ra…I mean Sonic games will pick back up now. Too bad we won’t have a comic to share the times with. Well, congrats Tim. I hope her birth is a smooth one. Oh, and name her Kefka. JK, that’s not even a girl’s name! Well, atleast go for Madyson or Timletta or something. Ah wow congrats! hope that 2pstart doesnt die though. I don’t think that this site is going to die. I do predict that we are going to see a lot of proud dad comics come this fall. Oh, I liked the comic, especially the garbage and crap scheduled on the calender. Congrats on the news Tim!! My sister had her son about a month ago and its a strange feeling holding a little one in your arms. It is great fun (granted its not MY kid but still…) I look forward to seeing pictures of the Amy Rose bonnet from Uncle Ray. Long time fan of the comic (since the Brawl Auditions) and the podcast (since the Boss Music episode) and decided to mosey on out of my grave. Also, love this comic. Another good laugh from 2pStart.com. Keep up the good work! Call her Devon after your most devoted 2p Starter (read: ME). please stop being a creep. Augh! Almost forget, a name! and in all seriousness, Serene. That’s my niece’s name. Ray, did you write “2P START! DIES” in blood? Congratulations! Tim, you better bring this child up on games correctly. As soon as s/he can talk, give him/her an NES controller and give a history of games class in chronological order so that s/he can appreciate the finer points of games and how far gaming has come. Isn’t it obvious? Once 2P START! dies, Ray will finally have time to take out the garbage on Mondays and take a crap on Wednesdays. He’s been so busy with the comic/podcast that he’s been piling up garbage in his house (and in his bowels) for two years! Oh yeah, and for a name… Julianna? Save the “trash talking” for the podcast guys. Oh and i dont really dont get the logo. A clock? shouldnt Ray be the minute hand. Unless i just dont get it. How’s that finger treating you? I had a neighbor named Edith. She had a cat that would take a dump in our flower pots and she (Edith, not the cat) was always cranky, so I am not to partial to the name myself. I’m not gonna say congratulations. Everyone else has said it, but not me. Instead, I will say what wonderful fortune has fallen upon thee! Prithee, let ye be jubilant. Blah blah blah. A good piece of advice is a name that can be shortened to a smaller nickname. Have them grow up and be called by the shorter name all the time. Then, you can call them their full name and they know they are in serious trouble. Seriously though, a name that can be shortened can be great. They can choose how they want to be addressed. I have a name like that, I like eet. For actual name suggestions, I have always love names that begin with S, such as Serene, Sonia, etc. What about Holly, Julia, or Larissa? Those are good names too. I don’t know, something that rolls off of the tongue. Name her Ada… I like that name so much. Congrads Ray! For the people suggesting (serious) names, one thing to consider is how the first name works with the last. For example, one of my friends was almost named Bruce…nothing wrong with that in and of itself (mind you, I don’t like the name, but never you mind). The problem (almost) was that his last name is Lee. BTW, Tim, tell Sarah to make the baby 3 days overdue. Then I can share a birthday with her! But on a more serious note, I’ve always had a partiality towards the names Elyse and Amelia. Ive decided to rise from my grave to congratulate you! I’ve always loved the comics so please don’t destroy 2pstart. About the name, you could do something videogamey but subtely so she will only know about it if shelikes video games. Amy or Rosalina would be cool. Woah, after reading that, i realized who he was! My head liteally lifted up in remembering. Hope you’re finger’s better! Shew!!!! I just started liking you guys. If I had a daughter, I’d probably name her samus. but then again, considering the way kids are total jerks, that’d probably not be a good idea. *sigh* 2p start had a good run. I am not, It is a running gag of sorts that Tim’s wife is hot, and Pregnancy has a way of making ones look funny because of the big belly. This was priceless 🙂 Another great one! You should try Lura as a name for your little girl. It sounds mysterious, almost video-game like, and it’s quite unique. How many girls do you know who has the name Lura? A couple people suggested you call her Samus. If you are gonna go with a video game character, make it more subtle than that! Call her Samantha or something. Little Sammy can be a normal person, and you still get the joy of telling her she’s a video game heroine. My first is due in September, so I know how you must be feeling right now. At least I know how I’m feeling – ABSOLUTELY FREAKIN’ INCREDIBLE! Anyway, hope 2p Start really doesn’t die.. and I want a 2p Start Calendar too!!! Oh wow congrats! Love how you worked that into a comic, though. lol. As for names… Hm… Someone suggested Maya which is a good name… What about something simple like Jenna? Tim, if you have a son, name him Richard! K0|\|GR47Z! As for names? Maybe Chell. It’s the name of the main character from Portal, which is a game that you guys should definetly make a comic about. I’m thinking along the lines of one of you being an Aperture Science test subject and then one of you does something stupid with your Portal gun, a turret, or a companion cube. But back on topic. You could also call him/her Morgan. Morgan Freeman is the main character of Half Life 2. Or maybe Sasha. In Team Fortress 2, the Heavy’s gun is named Sasha. Whoa, Orange Box fever, here. You could also call him/her Morgan. Morgan Freeman is the main character of Half Life 2. I think you mean GORDON Freeman… (sweatdrops) Same protagonist as Half Life 1. It’s Gordon. This one really made me laugh. Ah well, I’ve already got it anyway. Although GX Echidna would if he saw this. Crud, messed up my comment. well, i guess it’s about time i rose from my grave. i don’t have much to say about this comic (it is funny though). i’ve been reading since about here: http://www.2pstart.com/2008/04/30/so-close-yet/ and i really enjoy the comic. as for the podcasts, i’m still catching up on those, but they’re funny as well. Damn you Ray and Tim! Just when I thought I could control myself and find a perfect time make my rise from the grave special, you guilt me into rising prematurely. On a serious note, Congratulations Tim! I hope you and Sarah the best with (and for) your baby. This includes ignoring any and all suggestions for names coming from this comic (unless you wish to scar your daughter for life as a social experiment). 01/21/09 Panel 3 OR Wallpaper 3). I see dark-green highlights, and although blurry, I can’t find any other comic with such dark colors. Although I’d like to say I’ve listened to every podcast, there’s just toooooo many of them, and to make up for it, I’ve listened to the first 5 and the last 25. That sums up most of them right? Congrats, Tim! I can’t think of any names off the top of my head . . .
And by the way, in the comic. Is Tim . . . crying? Is it just me or is there a tear in his eye? And you’ll be devoting so much time and money to raising your daughter that your poor swimming pool of money will be become an ocean of diapers and expired baby food! I think saying that GX would get it kind of gave it away. Whoops! You’re right. Thanks for the correction! WHy is my Icon Doing this again?? Ok i’m going nuts here. Ok, don’t quadruple post. That’s just spam. I see Toon Link on a windwaker boat, so I’d say the April Fools comic, Wind Waker Heart Breaker. 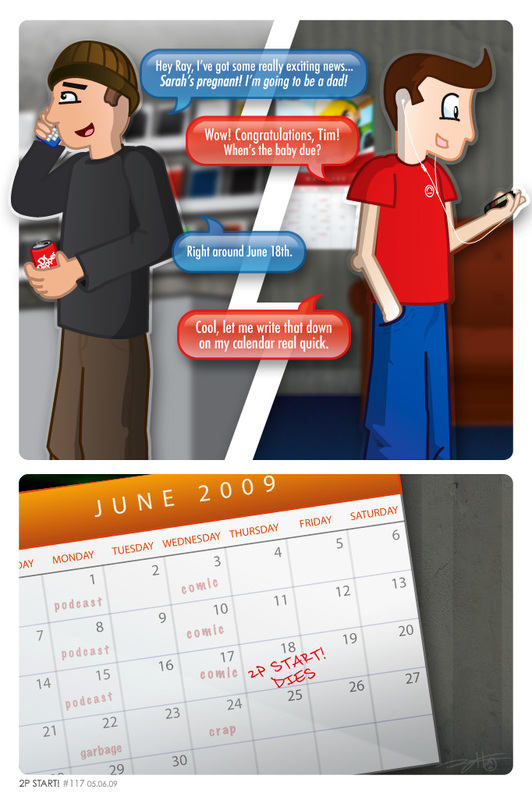 I said the June 2009 Calender, not the May 2009 Calender ^^. Tim-antha will be born right after E3! Looks just black to me, really. Probably because they haven’t drawn the comic they are going to use yet. Sorry about that. for some reason my computer was going nuts anyways hi. it good to see a new face. Well, I figure I can try to make this special and guess that the June 2009 Calender picture has to be from lost in translation (Comic #102 01/21/09 Panel 3 OR Wallpaper 3). You’ll find out for sure on the podcast Monday. THAT’S MY BIRTHDAY, GAH! WHY DO SO MANY PEOPLE HAVE TO HAVE THE SAME BIRTHDAY? Tell your wife that the baby needs to get here sooner or later, just not the 18th. Alternatively, you could name her after me. It looks black? That’s strange… try tilting your screen and or going to the site on a monitor that has been color-fixed. There’s most definitely a green highlight that looks like ground/forest. As a semi-artist and a user of illustrator/photoshop/gimp… I make sure I keep my monitor as close to color perfection as I can. xD. I’m a little late to the party, but congrats Tim! As for a name, I like Christine, but that’s just my opinion. CRAP. What happened to the clean 2pstart? Been here since Untold Origins. i was here when it first started. i’m in Number 11 in the Old Contest and i got comment of the week in Number 3 on the pod cast or was it 4. I can’t remember. Ok this is getting giant so I’m cutting it down. We were only off by a few episodes, I showed up at episode 7. But here I’ve been here WAAAAY longer. So I still win. i first found out at Dueling analogs when Tim was Advertising 2pstart Before it even went up. So i win now. I am a little late to the post, but congrats on the baby news. Episode 4- act 7 Was A LONG time. ABout 2-4 weeks between episodes at that time. And plus, i’m cooler. Since When were YOU involved? And that chain was really getting long. Gratz man! Has Samus been suggested yet? What? You mean you didn’t read through all 135 other comments to check to see if it had been suggested or not? Hey, Ray, I just noticed how your hand and Tim’s elbow stick out of the comic a little bit. I just thought that was a pretty cool artistic element. Btw, which username do you prefer, BadnikHunter or Elipse? OH and what about you, Jordan or Gadoink? Do you guys really need to keep quoting the posts directly above the one you’re making? Really? Sorry, it’s a pet peeve of mine, but seriously, if you spend more time scrolling through quoted comments than you do for some of Ray’s comics, there’s a problem. hey Ray, how come Tim has a toung and mouth, but yours is jsut a solid colour? do you knwo have a tounge? I think Gadoink as I’ve had it for ages, but I also like Jordan because it isn’t as strange to read out loud =P So I really am not sure. Use whichever you feel like, I guess. how’s going to be called?